The range-wide distribution of Rhynchospora capillacea, like that of many highly specialized species, is local and disjunctive. It is considered very rare west of the Mississippi River, as well as in many portions of its eastern range. Although the species occurs over a relatively large portion of Minnesota, it is predominantly restricted to small, fragile, native wetland communities referred to as calcareous fens. Fens of this type are often only a hectare in size and are maintained by the local discharge of cold, calcareous groundwater. The integrity of the underlying groundwater is critical to these habitats, and several are currently threatened with disruption or drawdown of their groundwater supply. This is especially true of isolated calcareous fens in the prairie region of the state where agriculture is intensive and groundwater resources are often heavily exploited. Rhynchospora capillacea populations in the forested region of the state occur in calcareous fens that have developed within large peatland complexes instead of in a prairie matrix, and are referred to as spring fens. These fens are small, local, and quite distinct from the acidic environment of the vast ombrotrophic bogs and poor fens. 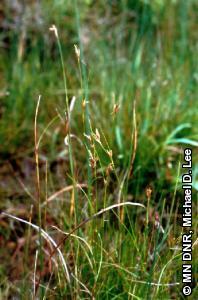 Rhynchospora capillacea was listed as a threatened species in Minnesota in 1984. Rhynchospora capillacea is a very small, inconspicuous plant and may be nearly undetectable when it grows among other sedges and grasses. Furthermore, field identification can be difficult for those not accustomed to working with sedges. The very thin capillary stem and reddish-brown color of the spikelets are strong field characteristics, especially in the prairie region where it is the only member of this genus. However, in the peatlands of northwestern Minnesota, R. capillacea can be confused with R. alba (white beak-rush) or R. fusca (sooty-colored beak-rush). It differs from them in having 6 retrorsely barbed bristles (or seldom smooth) on the achene and 3 stamens. The primary habitat of R. capillacea in Minnesota is calcareous fens, as they occur in the prairie region of the state. Calcareous fens are groundwater-maintained wetlands that have a deep accumulation of peat. These native plant communities have a high pH, high levels of dissolved minerals, and low levels of dissolved oxygen. Within this habitat, R. capillacea prefers the margins of calcareous fen pools and marl flats where competition is minimal. A secondary habitat for this species is spring fens that have recently been discovered within large peatland complexes in the forested region. This fen type is quite similar to the calcareous fens of the prairie region but does not exhibit the extremes in water chemistry. Rhynchospora capillacea is an annual and reproduces only by seeds. It may form tufts or dense mats if competition allows. It begins its annual growth in late spring, but does not become generally visible until mid-summer when it flowers. Fruits (achenes) mature in late summer and autumn. They remain dormant until the following spring when they germinate (Gleason and Cronquist 1991). The best time to search for R. capillacea is when the reproductive structures are fully developed, from late July through September. The R. capillacea populations in the prairie region are experiencing a serious decline. Unfortunately, several local extirpations have already been documented. Examples include the population in Blue Earth County that has been destroyed by industrial development. Of two populations in Dakota County, one was extirpated by road construction and the other by a lowering of the water table that resulted from dewatering a nearby stone quarry. Another population in Norman County was destroyed in 1983 by a water impoundment project. Existing and potential threats to surviving populations are numerous. Clearly, the conservation of R. capillacea in Minnesota is tied to conservation of the specialized calcareous fen habitat upon which it relies. A typical calcareous fen may be only one hectare in size, but the recharge area that maintains its groundwater supply may cover thousands of hectares. Because of their dependence on delicate hydrologic conditions, calcareous fens can be indirectly affected by activities such as gravel mining or wetland drainage that occur several kilometers away. Without safeguarding the hydrologic regime of calcareous fens, the security of R. capillacea's habitat, and therefore the species itself, is uncertain. The Minnesota DNR County Biological Survey has searched for rare biological features in many of the counties where this species occurs and discovered a number of new populations. Many populations occur on private lands. Although calcareous fens receive a degree of statutory protection, these populations may still be vulnerable to threats such as disruptions to regional groundwater patterns, road construction, livestock grazing, and encroachment by Typha spp. (cattails), Phragmites spp. (reeds), and other aggressive invaders. There are also several occurrences of R. capillacea on state-owned land, but their future is also uncertain unless the entire hydrologic system that sustains the fen community is left intact and attention is given to other off-site threats.